Developed using medical insights, the Ski~Mojo knee brace for skiing is a device that uses spring recoil technology to take up to a third of the strain off the legs and knees by providing kinetic energy to assist leg extension. Ski~Mojo supplements the power of the leg muscles, this in turn reduces impact, substantially delays muscle fatigue and alleviates leg and knee pain. Since its launch in 2007 the Ski~Mojo has been developed and honed into the latest version. The Ski~Mojo works like an exoskeleton for the legs consisting of a lightweight comfortable harness with neoprene knee supports containing powerful springs. 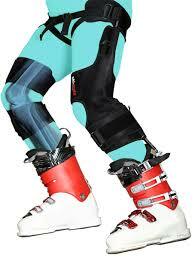 Ski~Mojo enables the wearer to ski for longer and avoid the leg pain and fatigue they would otherwise experience. "The Ski~Mojo is like fuel injection for your skiing. The Ski~Mojo is loved the world over by those who want to enhance their technique, extend their ski day, reduce impact and eradicate pain. The product is unique and its benefits are life altering."